Support up to 2000 Users . 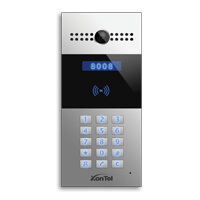 Vandal resistant body, with flush buttons . Two-way audio communication over IP networks with Echo Cancel feature. Complies with SIP standard for easy integration in every SIP capable PBXes . Camera: 3M pixels, automatic lighting . Numeric keypad with extra buttons .